UPDATE: Grimmly pointed out there were notes from the previous conference (9/2) as well, thanks G! – I posted them after the first one here. 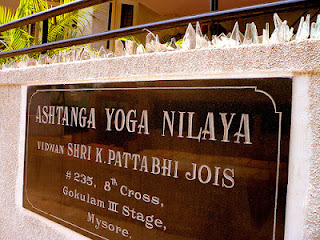 There are millions of asanas and only God knows them all. They are named for many living beings. We know only a few but think we are masters. Dracula definitely puts the cherry on the top on this Friday the 13th. I suppose Sharath is the last person I would have thought would compare himself to such a dark, night character, but there you have it. Here is the Questions and Answers from today, and yes, I had a pen and paper on me, about time! Sharath: The Yoga Sutras are difficult to understand, not easy [laughter]. Led class was sweaty and full today. James was put into head-stand with Saraswati’s help. It was not the first time he did it but it was the first time I saw it, and it was beautiful. Conference time started with Sharath asking for questions this time. Some came through and again I did not have pen and paper nearby so this is what I remember of the answers. What was striking was the silence, and respect in the room. Sharath: Yes, it is important to maintain focus. This morning Sarawatti got me to get the hands through the lotus legs in Garba Pindasana, wedding and engaging ring and all, and with no water sprayed on them… A first. She also rolled me around and I am pretty sure there is a picture or a video of it, hope it does not make it to the Facebook. I was just not sweaty enough and I thought I would get away with just rolling with free hands. Not the case. Back home I realize it is the rest time of the month for me. No wonder I have little ideas for blog posts.